Holidays and health: the thermal baths of Bibione and much more! Rediscover your vital energy and a feeling of wellbeing, take care of your health and beauty, enjoy pampering along with our loved ones. Thanks to the natural element, a valuable, generous surrounding: the waters of the hot springs of Bibione. Right in the heart of Bibione, where the blue of the sea meets the green of the pine forests, there is a space for rejuvenation, a modern re-examination of the ancient “Salus per Aquam”, ideal places for a healthy body and a peaceful mind to achieve “Health through the waters”. The hot spring waters that bubble up a short distance from the sea at a temperature of 50° C are used for all the hydrotherapy treatments offered, and their effectiveness is recognised by the Ministry of Health. The thermal bath facility in Bibione offers a variety of cures like mud therapy, hydrokinetic therapy, massage therapy and rehabilitation treatments for all ages. The treatments at the Bibione Thermal Baths are listed with the National Health Serviceand offer European Community citizens access to reimbursements for medical expenses, per European Directive 24/2011. Of course, there is a Spa and a Wellness Centre, both offering treatments for health, beauty and fitness. It is equipped with saunas, Turkish baths, sensory showers, massages, covered and uncovered seaside swimming pools and a modern fitness centre. Bibione Thermal Baths, you are in a dimension that allows you to slow your frantic pace and rediscover the pleasures of tranquillity and self-care. You can get treatments and restore yourself by choosing from various programmes depending on the length of your stay: whether it is a week-end or a week, our customers are always given advice and attended to by a team of doctors and therapists. To get a prescription for completely personalised treatment programmes, just make a reservation for a specialist appointment at the reservation centre for the thermal bath facility, or come here with prescriptions from your own family physician. The thermal baths at Bibione are listed with the National Health Service for balneotherapy, mud therapy and mud-balneotherapy for vascular diseases, respiratory and pulmonary diseases and intra-tympanic insufflations. At the Thermal Baths with children: the benefits of a seaside holiday! Without having to pass up relaxation and fun, at the Bibione Thermal Baths you can take care of your children who have disorders related to respiratory illnesses and allergies. The paediatric department, featuring surroundings designed especially for little guests in and outside of the facility, has modern, sophisticated advanced technologies and doctors specialising in ENT and pulmonary issues. After a first introductory consultation, these doctors can prescribe the best treatment for your child. The cures are personalised and children aged three and up can be treated. Taking care of one’s children at the Thermal Baths does not mean sacrificing your holiday: the department and the medical personnel are available both morning and afternoon, allowing families to schedule their days between the beach, fun and relaxation, without being restricted by limited hours. Recovering one’s wellbeing and vitality, getting beauty treatments and pampering oneself along with those we love in a natural, refined and generous setting: these are the benefits of the waters that bubble up just steps from the sea of a temperature of 50 degrees. Regarding relaxation as a therapeutic technique, Bibione Thermae created a Wellness Centre where personal attention is absolutely considered to be the most important mission. Because the philosophy that inspires its daily work is this alone: popularising the culture of wellbeing through high-quality services and products. A spa, a remodelled wellness centre, indoor and outdoor swimming pools, hydro massages, thermal showers, saunas with sea views, Turkish baths, areas dedicated to relaxation, fully equipped areas indoors and out and highly specialised personnel: Bibione Thermae is wellness to be experienced all year ’round. another reason to rediscover the pleasures of self-care. Bibione Thermae partners with many of Bibione’s hotels to offer personalised solutions to meet a variety of curative, aesthetic or just relaxation needs. 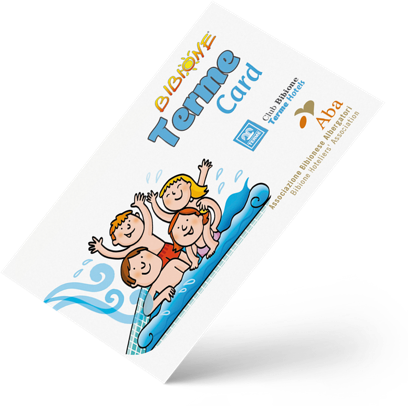 With the Card, you can enjoy a special discount on thermal cures, aesthetic treatments, other specialities and the purchase of products from the Spa Bibione Thermae line.